After a failed attempt at getting Trimble Outdoors on my "Crackberry" a month or so ago, I thought I'd give it another shot. You see, the first time I tried, I got to a point where I needed the Blackberry App World app on my phone to download and install Trimble. Unfortunately, the phone's operating system was an older version and not supported by the Blackberry App World app. Might I also mention that my Blackberry is provided to me by work so I was hesitant at doing much with it to begin with. After a months time, I decided I'd look at it again and somehow figured out how to upgrade the OS on the phone. After that I was off to the races. Blackberry App World was installed and after we had to ditch our plans for a Saturday hike, due to the kiddo not feeling well, Robin convinced me to take The Beene to the park for a walk. Off to Big Ridge Clover and I went for a little walk, a very short hike in all actuality. It was the first warm, sunny day we've had this winter and I had figured we'd just walk our normal route up to the group camp from the Gristmill. 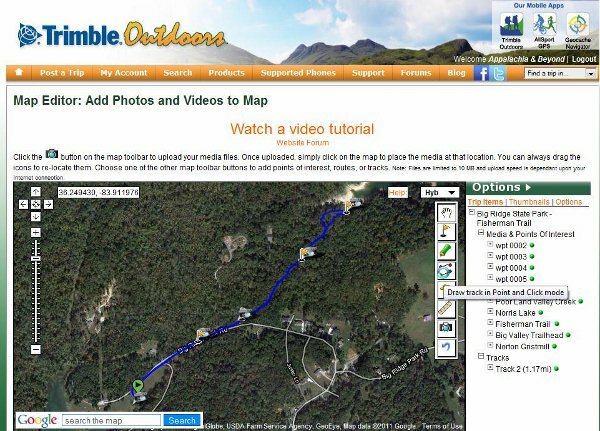 Upon pulling into the gristmill parking lot, I took a moment to download and install the trial version of Trimble Outdoors. 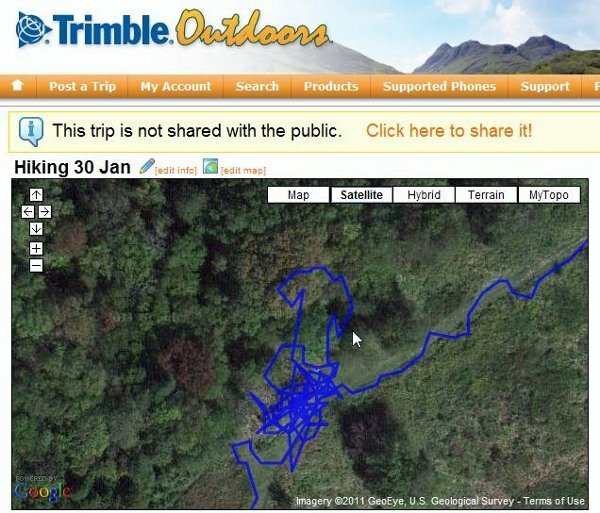 I figured this would be a workable solution to share our tracks mapped out on our hiking posts. Okay, before I continue further, let me say this. I've been using a regular Garmin e-Trek Legend for sometime, but electronic solutions are still no match for a plain old map and compass. Even though I've never learned to navigate with a map and compass (that will be resolved as I learn meself how through Cardinal Points software by Yon Yonson). I can read a map and we rarely ever hit the trail without having done our research and bringing a map and/or a guide book. So where was I again? Oh yeah, Trimble was freshly installed and The Beene and I were on our way. It took no time at all to start tracking our walking trip on Trimble. Really it's pretty self explanatory and an intuitive user interface. Rather than walk up to the group camp, I decided we'd walk back towards the Fisherman Trail. I wanted to see how accurate this thing was. Trimble is a pretty sweet GPS app for the phone I must say. 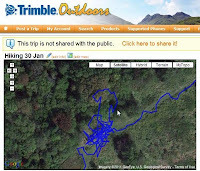 I was able to mark waypoints with ease and take photos that show on our GPS track with decent accuracy. 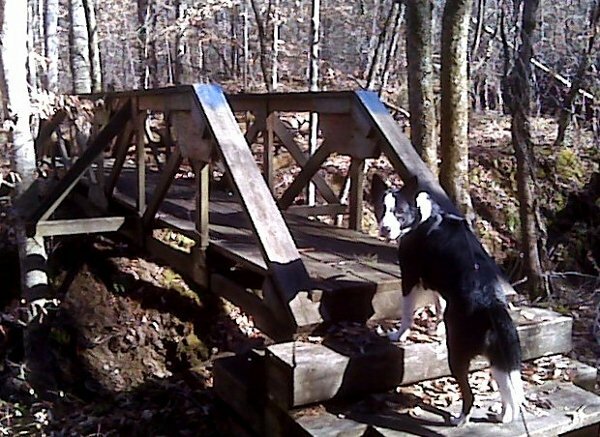 After we were done with our walk/hike, Trimble showed a total of two miles. It sure didn't feel like it considering the Fisherman trail is only .3 miles one way, and the walk to the trailhead is maybe .25 miles.No worries though, I still had to check the online portion through my account at home. By the time we made it back home, the trip had already uploaded to my online account automatically (you can turn that off if you like). Unfortunately not all the photos I had taken had uploaded with the trip so I had to manually re-upload the whole thing. I don't fault the app for that, I fault the signal I get out 'cheer' in tha sticks. I was able to upload the trip without much effort and got all the waypoints and photos with no problem. Looking at the trip online, I could tell that the GPS was all over the place but I'm used to that with the Garmin in the woods. Luckily, once logged in at home I was able to edit the track (actually laid a new track over top the one that uploaded and deleted the original. Don't worry the waypoints and photos stay right where they are and you can tweak those around if needed too). After doing all that, the trip mileage was calculated by Trimble to be 1.17 miles which was more like it compared to 2 miles. I have to say that part of the way down the trail, I wanted to change the activity of the trip from walking to hiking but in so doing, the walking trip ended and a new hike trip began in the app. So be sure to pick the right activity before starting out other wise you may have to manually merge them at home like I had to. There's no way to import a track from one trip into another, at least not that I could easily find. We Apparently Hiked a T-shirt. I've used Trimble one other time since then. It was the very next day when Robin and I went and hiked at Seven Islands Wildlife Refuge. It showed we had hiked 5.99 miles after all was said and done. The track was all over the place but the general route was correct. After post trip edits it turned out to be more like 3.72 miles. 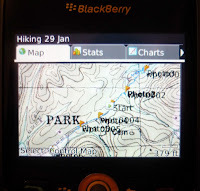 On our next hike I plan on bringing the Garmin along too just to compare side by side. Overall, I think I will pay the $9.99 for the app and continue to use it as it will add that extra touch of interactivity to the blog for you, our readers.